Slightly stepping away from beauty stuff today and onto some skincare. I had mentioned before that I have a serious problem with dark under eye bags (see my preview here of a Benefit concealer that will hopefully clear this problem up) and rather than continuing to hide the issue, I thought it best to go straight to the source of the problem and get an eye cream to see if that could solve my woes. As I’m in my mid twenties and no longer the sprightly young thing I once was I thought it was time to venture into the territory of eye creams. There is so much choice, so it was slightly daunting trying to decide which one to try first. I’m sure many my age have, or have had, this head wrecking dilemma at some point. It was time to research, and research good. I knew I had options (there are a ton of different creams out there after all), but my beef was that I’m a fusspot. I knew what I wanted in an eye cream: something that was light, simple, something that didn’t cost an arm and a leg, and finally would take the burden of my dark bags away (mine are so dark, you would think I got an accidental box in the face). 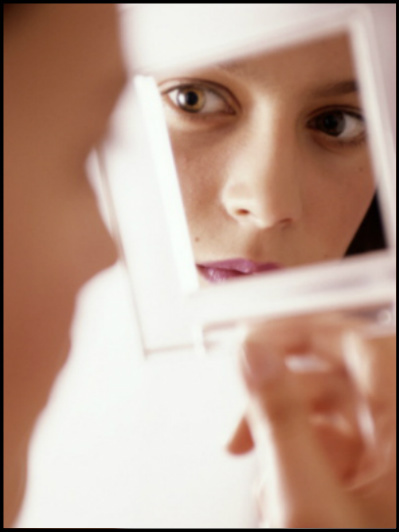 I wasn’t looking for a miracle worker, just a cream to ease me into the whole thing gently. I’d tried expensive creams by both Lancome and Clinique in the past and been very unimpressed (and out of pocket! ), so I was not a happy camper. 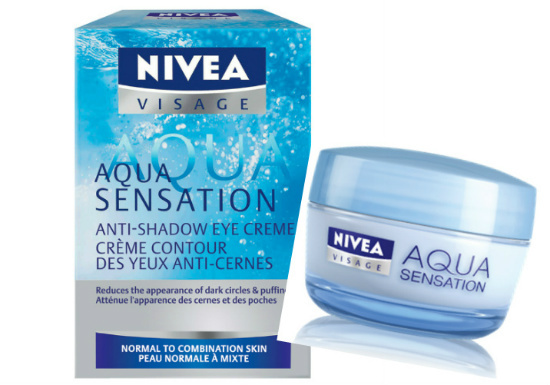 Then one day I randomly came across this gem: Nivea Aqua Sensation Anti-Shadow Eye Cream, so I decided to give it a whirl. It’s definitely, not a newbie, it’s been on the market for a while but don’t let that put you off. I was very surprised that I got such good results with it, but darn it, I did! The thing that’s great about this, is that it delivers. No mess, no fuss and no fancy packaging. It’s not going to work miracles mind you, but if you’re a first timer to the whole eye cream thing, I think it’s best to start gently and with something simple. Don’t make the mistake I did and fork out for the expensive stuff right away. Under eye bags be gone! It lightens up those dark bags. With regular use over the last 8 weeks, I’ve noticed a great improvement. They’ve definitely faded and I no longer look like I’ve given myself a thump. Moisturies really well. I notice a huge difference on this whenever I don’t use it, so it’s doing the job! It is super light and super gentle on that delicate skin around the eye. A good one for those with ultra sensitive peepers. Smells oh-so-lovely. Like the majority of Nivea products, it smells fresh and lovely. Dries quickly. Very important if you have to lash on your makeup and leg it out the door in the mornings. Keeps those pennies in your purse. For €12 you get a grand sized tub (it looks small, but you just need a teeny amount per go) and is in a great mini pot perfect for your handbag. Yay! It’s a really nice, basic eye cream for those with young skin looking to banish those pesky under eye bags and get the (eye cream) ball rolling gently. And the price is right too! What do you think? Would you give it a go? What eye creams would you recommend? Tell us in the comments below! Great review this sounds good!